Last April Mitchell and I had a discussion concerning our swing set. He was right. I'm glad we kept it. I love the pink swing! Brooklyn is visiting later today to try it out! Woot! 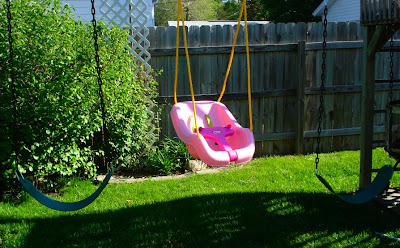 How cute is this that you posted a pink swing on my pink kitchen day post!! It looks delightful and I like to swing on swings too! My Doctor to the rescue! Off to see my baby! !